Monticello is the historic home of Thomas Jefferson, one of the most influential figures in American history. Among his many accomplishments, Thomas Jefferson served as the third president of the United States, authored the Declaration of Independence and founded the University of Virginia. Monticello, which is located in Charlottesville, Virginia, is a National Historic Landmark and, along with the University of Virginia, a UNESCO World Heritage site. It is the only house in the United States to receive a UNESCO World Heritage Site designation. Thomas Jefferson, a self-taught architect with a keen interest in classical design, drew much of his inspiration for Monticello from the architecture and writings of Andrea Palladio. A blend of ancient architectural principles and forms with new ideas and inventive features, Monticello is a notable example of Roman neoclassicism. Throughout four decades, from 1769 until 1809, Monticello was an ever-evolving work in progress as Thomas Jefferson designed, expanded, remodeled and reconstructed portions of the main house and several other buildings on the estate. Monticello remained his beloved home for 56 years until his death on July 4, 1826. 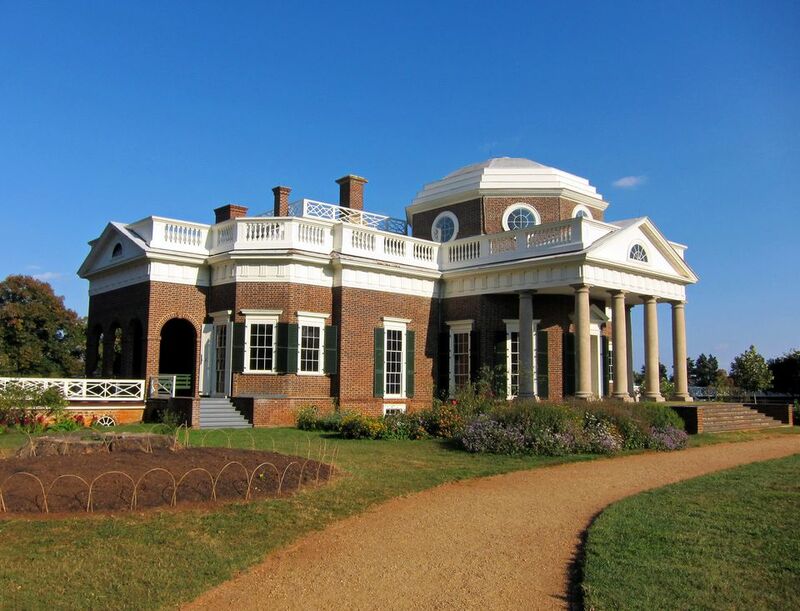 Today Monticello is owned and operated by the Thomas Jefferson Foundation, Inc. a private, nonprofit corporation, founded in 1923. It is open every day of the year, including Sundays, except Christmas. Reserved tickets may be purchased online up to midnight the day before for most dates. Monticello uses timed entry ticketing for house tours. Ordering tickets in advance of your visit will help you avoid a potentially long wait for the next available tour. Same-day tickets are available every day at the Monticello Ticket Office. Although same-day tickets for special tours and events are sometimes available, reservations are highly recommended in order to avoid possible disappointment. Monticello is located in Charlottesville, Virginia on Route 53 (Thomas Jefferson Parkway), accessed from Interstate 64 (Exit 121 or 121A) and Route 20. Visitor Center: The new 42,000-square-foot Thomas Jefferson Visitor Center and Smith Education Center complex, which opened on April 15, 2009, features interpretive and educational elements, a café with indoor and outdoor seating, a gift shop, and an indoor ticket and information counter. Allow Plenty of Time: Arrive at least 30 minutes before your scheduled house tour timed entry to allow enough time for the shuttle bus ride to the house. In addition to the 30-minute house tour, there are other interesting areas of the estate to explore so plan to allow a few hours for your visit. Dress Comfortably: Wear comfortable shoes and weather appropriate clothing to enjoy exploring the outdoor areas of the estate. When to Visit: The months of June through September, when the gardens are in bloom and additional guided tours are included in the price of admission, are the most popular time to visit Monticello. Pronunciation of Monticello: "mon-ti-chel-oh" As in the Italian language, the "ce" is pronounced with a "ch" sound and not an "s" sound. Boar's Head Resort: A charming AAA Four-Diamond rated country resort featuring one of the areas finest restaurants, a nationally acclaimed golf course, a luxurious spa, and well equipped Sports Club, located just five minutes from downtown Charlottesville. Keswick Hall: A country estate on 600 acres, located about 15 minutes from historic Charlottesville, featuring an 18-hole Pete Dye-designed golf course, full spa facilities, fitness, and wellness center, tennis courts, indoor and outdoor swimming pools and more. Omni Charlottesville Hotel: Conveniently located adjacent to the historic Downtown Pedestrian Mall, features include a seven-story glassed-in atrium and a lush garden style atmosphere. The Inn at Monticello: A comfortably elegant bed and breakfast inn located within 2 miles of Monticello and a short drive from downtown Charlottesville.